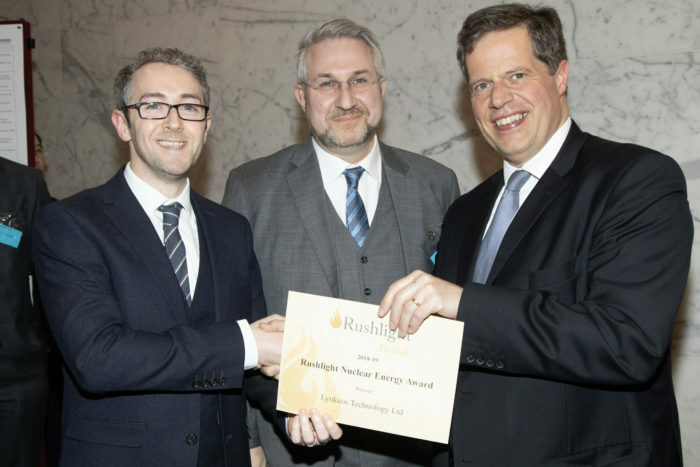 Last night, Lynkeos triumphed at the Rushlight Awards hosted at The Royal Society in London. We won the Nuclear Energy award as well as being ‘Commended’ in the Energy Environmental category. A massive thanks from the Lynkeos team to Innovate UK who sponsored the Rushlight Show for selecting us to showcase at the event. Lynkeos directors David Mahon and Ralf Kaiser with Julian Critchlow, Director General, Energy Transformation & Clean Growth, BEIS.